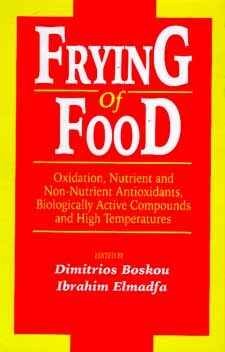 Frying of Food Technology Book from C.H.I.P.S. Discusses two new approaches for the assessment of thermally oxidized fats, based on measurement of oxidized compounds and impaired lipase hydrolysis. Discusses performance of high oleic acid oils in relation to their fatty acid composition and the presence of natural antioxidants. Frying of Foods is the first reference to examine frying of food from the point of view of changes occurring to biologically-active constituents and the effects of such changes on the stability, performance and nutritive value of frying oil. It focuses on the nature of the frying media and discusses changes to non-glyceride components, especially nutritive and non-nutritive antioxidants. This important new resource concentrates mainly on two factors that influence the deterioration of a fat at elevated temperatures: the nature of the heated fat and the presence of oxidation retardants, especially those naturally occurring in oils or obtained from natural sources. Discussions include important biologically active ingredients present in oils and fats (such as antioxidant vitamins and carotenoids), minor constituents (such as phytosterols, phospholipids and hydrocarbons), which appear to affect the performance of a heated oil and/or may also be categorized as functional. Frying of Foods also discusses olar phenolic compounds, which naturally occur in certain oils, or which can be obtained from herbs or spices. These compounds, which have an impact on the stability of oils at high temperatures. Frying of Foods will be of interest to food and lipid chemists, food technologists and product developers involved in the processing of foods by frying, and to those involved in fat and oil research, in quality assessment of heated fats, and in improving dietary fat intake profiles.